THE Church of St. Mary, Plumtree, consists of a nave, 38ft. by 2oft., with 13th century arcades, late Perpendicular clerestory, chancel, and south aisle, and a north aisle rebuilt in 1873, partly with stone taken from the old Trent Bridge at Nottingham at the time of its demolition. The western tower, of three stages, terminating in a battlemented parapet of late Tudor work, was so covered with stucco and ivy, that its western arch was the only visible external indication of its Norman character. It has been strengthened by a massive square buttress at the north-west angle, with a diagonal buttress added to it later. It opens to the nave through a remarkably thick wall, by a round arch of three square-edged orders with square abacus. The refacing which covered the old walls in the upper part having recently become dangerous, the tower was examined; and it has been considered necessary to pull down and rebuild the greater part of it. When I visited the church in April, 1906, the upper stage, and most of the north wall had been taken down, and the buttresses on the south side stripped off. The removal of ivy and stucco showed that the north and south faces of the tower were each ornamented in the lowest stage with an arcade of two round-headed recessed panels (Plate I.). 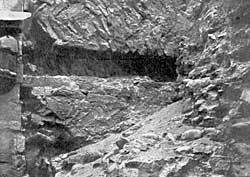 Above this, on the second stage, there was a similar series of three arches, the centre panel being pierced by a narrow window, wide splayed and with a roughly corbelled arch inside, but now filled up with rubble. 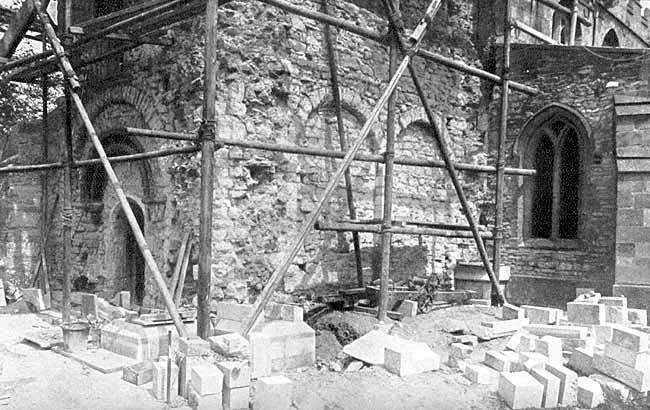 The arcading of the second stage was complete on the north wall before it was pulled down, but on the still existing south wall it has been obliterated by the 14th or 15th century refacing, which has extended down thus far. Close scrutiny of the stones, however, makes it clear that the two sides were alike. The position of the arcading and window is shown by dotted lines in the south elevation on Plate II. The lower stage of the west side has a single shallow arched recess, within which is a semi-circular architrave with a hollow and roll moulding, rising from a flat string abacus, below which are two caps, of which the angle shafts have perished, bearing, I think, traces of volute ornament. A plain flat-soffited inner order forms the west doorway, now filled with a four-centred arched door. The second stage on the west has been entirely refaced, and is pierced by a small two-light 14th century window (Plate I.). I consider this tower to be quite early Norman work of the 11th century. Similar arcading is to be seen on the middle stages of the fine central tower of South Lopham Church, near Thetford. PLATE III. Saxon wall, Plumtree Church. The pulling down of the north wall has revealed the interesting fact that the Norman tower was built up against an earlier Saxon wall, constructed of more durable mortar than the Norman work. This can be distinguished on the left hand of the tower in the sketch on Plate II., and the photograph, Plate III., by the herringbone courses of stones. The coign stones are destroyed or hidden by the north aisle. Parts of the exposed surface of the wall retain the original plaster, and across it there runs a chase about 16 feet from the floor, constructed in the wall for the reception of a joist 8 inches by 4 inches. If this supported a floor in a Saxon western tower it must have been a very large one; but it is more probable that the recess indicates the position of a wooden pent-house roof fixed externally over a door, and extending across the west wall of the church. The wall was carried up in later work of rough boulders to the steep pitch of the Norman roof. No further indications as to the extent of the Saxon building have been discovered beyond those shown on the plan. The three bells taken down from the tower bear the following inscriptions, the two first being by Henry and George Oldfield.